Russia is sending several ships that will arrive in a few days in the Mediterranean to protect their interests in Syria. 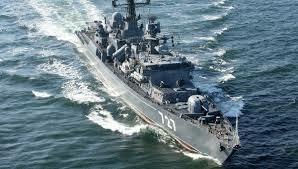 Two Russian warships and a missile cruiser are coming to strengthen their fleet. Russia is one of the big FIVE who would not vote for an intervention attack against Syria since they are Syria's main backer. In the meantime, talk is discussing back and forth about a date for the USA to punish Assad and tell him he can't use chemicals while Britain has had second thoughts and is still bantering the matter in their parliament. Actually, so is the USA, but Obama has already spoken and has said that the USA would take action even without the backing of allies or the UN. What he had chastised Bush about, he is now facing a very similar situation. Obama has meetings in Sweden and Russia to attend. He's leaving on Tuesday, so it is thought that something might happen before then. Are we going to hit and then have our Commander in Chief leave when all fireworks can start? If anyone attacks Syria, their promise is to attack Israel, who is prepared for that. They of course will immediately answer an attack, and they have been trying to stay out of the Syrian devastation. Syria's Civil War has been so close that some missiles had even landed in The Golan, which looks down on Syria. When you live among lions, it's difficult at best to get into the middle of a roaring and fighting pride. Assad has threatened Israel with a deadly attack from Lebanon, Iraq, Iran and what is left of their military and a surprise element of devastation. What? Atomic rockets from Iran? More chemicals, no doubt. Meanwhile, Assad has had time to leave Damascus and is safely hid out in Iran. Israel is ready with gas masks for any surprise in Assad's retaliation against their tiny nation. Psalms 108: 13-14 says it all. "Give us help against the adversary: for vain is the help of man. Through G-d we shall do valiantly: for He it is that will tread down our adversaries." Israeli's warriors know they cannot run and hide anywhere. They have nowhere to go. This is a fight of the likes of the 300 Spartans, only Israel feels they have help from their outer space guardian. Thousands of Syrians have already fled to nearby Lebanon to get out of the way of the West's attack. Not only did they have to worry about a crazed government with chemicals to use on them willy nilly, but now the West's answer to this use of chemicals which is not in the book of allowed war weapons. The signal these people had of their eventual fate was in how their government treated the Jewish population in their country. Confined on "Jew Street" and held as captives in a worse condition of any of the other dhimmis of the Middle East, the last remaining ones were finally rescued by Israel in 1994. As a country treats its Jewish population, so will the rest eventually wind up as the next scapegoat. The Christians of Egypt have found that out already with the Muslim Brotherhood's first reprisal being their churches and people. The Mediterranean will be full of Israeli, American, and Russian ships ready to fire missiles somewhere. The British might be in the mix as well. At this point, the USA is not sure what the target is to be as the Syrians have been busy moving their arms to high ground surrounding Damascus. Starting September 4th in the evening and going on into September 5th is the Birthday of the World, Rosh Hashanna, the start of a 10 day period of Jewish High Holidays ending with Yom Kippur, a day they were attacked on October 6, 1973 when everyone was in a synagogue asking for forgiveness from G-d of any sins they might be guilty of. It is a day of fasting and is the most serious day of the year. Unfortunately, the whole beginning of this New Year is now colored with threats from a neighbor of all their lives once again. On the sidelines of this stage are many Middle Easterners who are chomping on their bits at the thought of taking over Jerusalem. I say that G-d has been on Israel's side through thick and thin for 65 years since May 14, 1948. Israelis have been threatened when the odds were completely against them. What makes the haters of Zionism think that G-d's protection and direction has evaporated? It is even miraculous that as a people Jews have continued to exist from the days when Judah, 4th son of Jacob and Leah, was born. King David was from this tribe. Of all the ancient people, it is only the Jews who have been able to survive, even with Hitler's determination to do Jews in. The creation of their state once again has been prophesied to the amazement of all people. Just look into the "Old Testament.," It takes a lot more than plain luck to live that long in a world constantly against them. Britain has backed out, and no word from Obama by Thursday at 7:16pm.